Our gravel shooting trucks are built to to deliver and install materials of all sizes, and for various applications. From sand and topsoil to gravel, and mulch, Gravel Shooters can deliver the material you need, where you need it! Gravel Shooters has been placing sand, gravel, and various material for more than sixteen years to the St. Louis area. Our stone slinging trucks have the capability to convey materials up to 60 feet from the back of tires of the vehicle. We provide solutions for all of your gravel shooting, stone slinging, and material placement needs. We're able to accommodate projects of all sizes and work with various materials. We can save you time and money with our material spreading services. 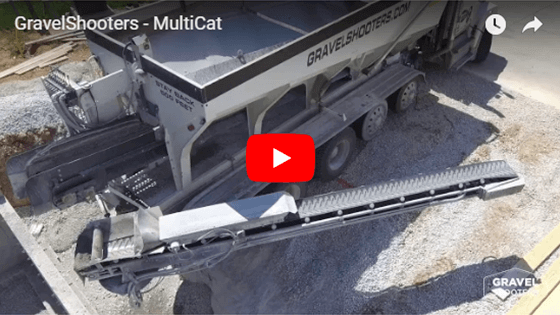 Gravel Shooters has earned an enviable reputation for job site safety, efficiency, dependability, and economy in the performance of it's many construction services. To discuss your next project and find out how Gravel Shooters can save you time, money, and labor, call us at 636-451-5915 or contact us online. The advantages of our material delivery & spreading service include fast transportation, placement, and leveling of materials. Laying down material around obstructions or over restrictive areas are no longer a problem with our stone slinging trucks. By delivering various materials with accurate placement, we can help you save time on any job or project! The Gravel Shooters staff were extremely helpful, friendly, and professional. They're not only knowledgeable about their services and products, but also have excellent customer service. Would highly recommend to anyone!